Kyle Abbott tried to stay positive in an otherwise dismal season in 1992, he told The Los Angeles Times. By that All-Star break, Abbott had picked up 11 decisions for the Phillies, all of them losses. "I'm happy with the fact that I've gone more than five innings in every start I've had. . . . The starts have been pretty quality," Abbott told The Times. "Except for a start or two when I haven't done my job, the rest of the starts I've kept my team in the game as long as I could." Abbott's positive nature, however, never translated that year into his stats. He finished that season, his second in the majors, with an overall record of 1-14 and a 5.13 ERA. He then went on to play in two more seasons, including brief time in Japan, to mark the extent of his career. Abbott's career began in 1989, taken by the Angels in the first round of the draft out of Long Beach State. Abbott turned pro after helping Long Beach to the College World Series. Angels scout Rick Ingalls told The Times Abbott came with a good recommendation from Long Beach coach Dave Snow. "Dave Snow told me he was the best kid he'd been around in terms of work ethic," Ingalls told The Times. "He throws in the low 90s and we think he will get as fast as 93 down the road. He has a fastball with good life, a hard-breaking slider, an overhead curveball and a good changeup." 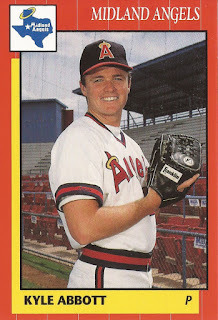 Abbott started with the Angels at single-A Quad City. He moved to AA Midland for 1990 and briefly saw AAA Edmonton that year. He returned to Edmonton for 1991, then debuted in Anaheim that September. Abbott got into five games for the Angels, starting three. He went 1-2, with a 4.58 ERA. He went six innings in his debut and struck out the side in the first inning, as well as gave up just two runs, but he still took the loss. "I thought it was a quality start," Abbott told The Times. "That's all you can ask for out of your first big league outing." He then moved to the Phillies for 1992 in a trade and turned in his 1-14 season. He then played 1993 completely at AAA Scranton. He went 12-10, with a 3.95 ERA. For 1994, he briefly moved to Japan. He got four starts for Kintetsu and gave up 10 earned in 11.2 innings. He returned to the Phillies for 18 outings in 1995, going 2-0, with a 3.81 ERA. Abbott then got his final big league time in 199 with the Angels. He got into three games, gave up nine earned in four innings of work to end his career.